But what sets Edgefinity IoT apart from most tracking systems is its ability to let non-technical users build granular rules that can generate customized reactions such as setting off alarms, sending out emails or push notifications, or automatically locking doors when a geofence is crossed. Here are some other ways Edgefinity IoT ups the ante when it comes to geofencing. Many facilities have security rooms, control rooms or other areas that have minimum staffing requirements. Within Edgefinity IoT, geofenced zones can be setup to alert when those numbers fall below the minimum of the type of employee required. Every employee wears an Edgefinity IoT active RFID tag that triangulates their position and identifies to the system which type of employee is at those coordinates. For example, if a security room has a minimum staffing requirement of two security personnel, the system always makes sure this is met and does not count any other types of personnel towards that number. Edgefinity IoT can also build some fudge factors for these rules. For example, an electric utility might have a minimum staffing requirement of two people in the control room, however, during the night shift they allow a drop to one for no longer than 10 minutes so that one of the employees can take a bathroom break as needed. A large threat to safety is when employees do not follow the rules on the protective equipment needed in designated areas. With Edgefinity IoT customers can specify which equipment is needed for each geofenced area. When an employee, visitor or contractor enters the geofenced area Edgefinity IoT will automatically check to see if the person has the necessary equipment. To accomplish this, each of the pieces of equipment are tagged and tracked with the employees. We have worked with companies to setup dynamic protective equipment requirements. Edgefinity IoT monitors sensor data, and when certain thresholds are met it enables the protective equipment rules. Another method we use is when personnel is above the ground – such as on a ladder or in an area with lifts, the tags have barometers to determine how far off the ground they are. Once they reach a certain height Edgefinity IoT can automatically check to see if they are wearing harnesses or any other required protective equipment. One area of concern to executives is unauthorized personnel or visitors entering their executive offices without their knowledge. During the work day, when an executive is in their office, there are no issues. The problem comes when they are out for a meeting or any other time they are not there. This is especially the case in modern open plan offices, ore even when a door is inadvertently left unlocked. Edgefinity IoT customers can set up rules for geofenced offices so that when an executive (or their secretary) is in the office, anyone can walk in with no alerts triggered. However, when the office is empty, and an unauthorized individual enters, Edgefinity IoT can automatically send notifications – such as a text message to the executive. Assets can be confined to geofenced areas, as well. Edgefinity IoT can be configured so that anyone can use or move the equipment within a specific area, but that only certain individuals are allowed to move the items from the area. 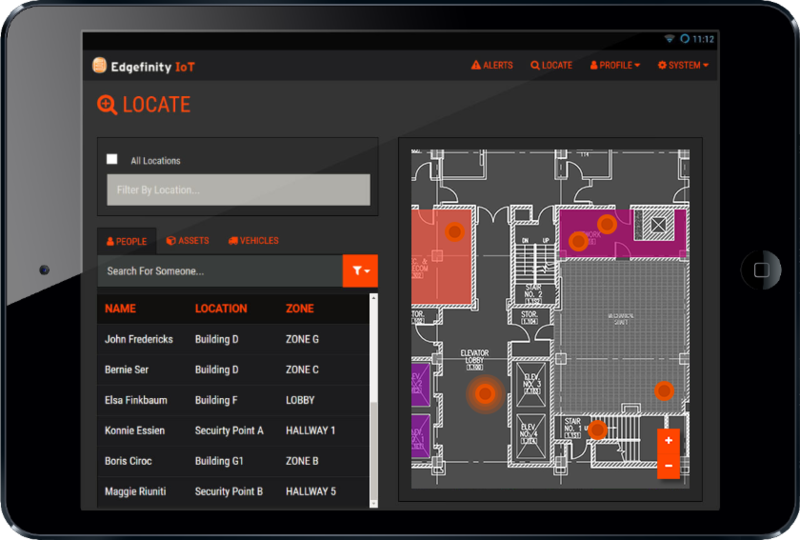 Once the asset is moved outside of the geofenced perimeter, Edgefinity IoT can automatically check the personnel moving the item to see if they have authorization to move it. If they do not have authorization, the system can trigger an alarm. Geofencing is just one area where Edgefinity IoT provides enhanced insight into real-time tracking and monitoring of assets and personnel. With Edgefinity IoT, customers can track the location and status of WIP (Work in Process) inventory, check if equipment is being used by unauthorized individuals, keep a record of the last recorded location of items, and monitor the safety status of employees. Edgefinity IoT provides the real-time tracking tools you need to attain substantial improvements in safety standards.